Back in April I had a bit of an unnerving day, which involved a bit of magic, and that magic first induced a good bit of panic, and well, frankly, abject terror, eventually more magic made things run smoothly in seemingly miraculous ways. Because obviously, when magic is the thing that made things worse, it's obvious that more magic will make things better? Right? Well...in a lot of cases yes. So I'm going to tell my story, because so far most people who've heard it have thought it was cool, but hopefully it will also illustrate how to simply use magic in situations that arise as well as looking at how more magic can fix magic that isn't necessarily going how you'd hoped. I, like most Americans, have a car. But, unlike a lot of people, I tend to not think about doing things I need to do for myself or my stuff, or my well being. For example, when I had pneumonia earlier in the year, it took two months of being sick before I went to the doctor because I figured, “I'll get better, and I don't have time to go sit at a doctors office or rest.” I spend a lot of time at work, and then I spend almost full time hours coaching, add to that blogging, other writing projects, the occasional bit of magic, and involvement in the local OTO body and I really don't have much time for me or things related to me. I'm usually pretty focused on the needs of others, or things I perceive as a duty to others and so I often deal with my own life when stuff explodes and forces me to look at it. Hopefully...I'll become more self aware and fix this at some point...anyway, for now, it provides the back drop for this story of magic, nearly crying in bed, more magic, and then success. So yeah...the car. Well, my car is a 2014. I got it as a birthday present to myself in 2014. It's pretty nice, has navigation, rear cameras, a sun roof the full length of the vehicle, leather interiors...you know, car stuff. But it's a little European car, and it's a slightly larger model of this typically tiny car, but the engine still seems to be made for the tiny version and so it doesn't have a lot of pick up. But apparently it's got a turbo charger...which I didn't know, and those are fragile, and require, well the basic maintenance that normal people usually consider minimal and required. So, I grabbed a bit of paper at my desk and cut it into a square. I drew a hexagram on it and in the hexagram drew the seal of Mars from the Heptameron and then like the seals from the Archidoxes of magic drew the planetary symbols in the points, but ordered such that Mars was crowning the hexagram. I added little crosses to the points like in the Lamen from the Heptameron and then drew a circle around it. I added the God name for Mars as given in the Golden Dawn's correspondences for Gevurah, and wrote the names of Samael, the angel of Mars, Samax who is the king of the aerial spirits ruled by Mars, and Carmax who is one of his ministers amongst the aerial spirits, and amusingly enough is also the name of the place from which I'd purchased my car. I felt the presence of the angel and I explained that my car was having difficulties and asked that he direct the aerial spirits to correct any problem so that I could at least get through the various things I had to do that day and make sure the car remained ok until I took it to the shop, and that I would do so the next day. I went home, I posted a big thank you to Samael on my Facebook wall. I went to bed. So, let's pause for the cause and look at what we'd done so far. First, it was a Saturday, but I called the angel of Mars (Tuesday) for magical help in a pinch. Mars rules over chariots, chariots in the ancient world largely being associated with war and battle. So the modern equivalent of a chariot would be a car, and thus Mars is the planetary ruler that oversees cars and other machines of transportation, but does not directly rule travel. 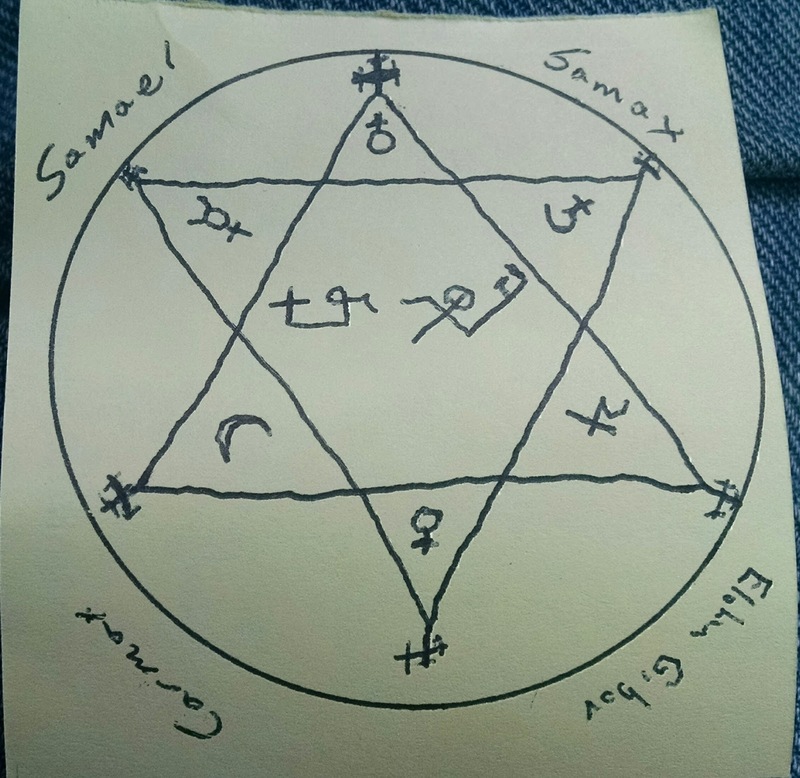 I didn't want Samael to fix my problem...I wanted Samael, to make Samax, make Carmax fix it. 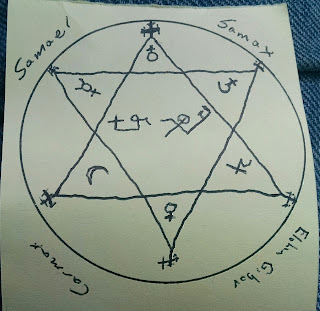 I needed Samael involved because he is essentially the governing agent set over that quadrant of creation, but asking the guy who manages the dealership to come fix my car probably won't do much, instead he'll tell the guy who runs the maintenance division (Samax), to tell the mechanic (Carmax) to do it. Another way to look at it is that Samael is an angel, and they are great at giving advice, telling you how to fix things in your life, initiating various powers into your sphere, and generally motivating big picture movements towards manifestation, but, while they can get hands on stuff done, they're not always focused on hands on manifest stuff, and sub-lunar spirits are better at that because they exist in conjunction with the manifest world. King Samax and Carmax being aerial spirits are spirits who are sub-lunar as in they exist within the earthly sphere instead of existing in the celestial sphere, there are references to aerial, and terrestrial spirits, and occasionally aqueous ones, as “demons” or spirits who exist beneath the celestial realm without being themselves infernal. The Theurgia-Goetia refers to aerial spirits as mixed nature, partaking both of good and evil, seemingly with the intention of saying they are partially of an angelic nature and partially demonic...this sort of blending is great for a comic book, but doesn't really fit into the worldview of the late medieval and early renaissance grimoires that predate the Lemegeton. At that point spirits were spirits and where they resided had to do with how they might be called and how they might serve you when they show up, maybe who they answer to, but not all demons who resided beneath the celestial realm were devils. So, consider the aerial spirits as being easy to access since they reside in the earthly sphere, useful for material needs, again because they reside in the earthly sphere, and somewhat morally ambivalent. They also generally arrive on the winds and should be called directionally and preferably in a space with access to air flow, although in my example, I'm at a desk in an office and it worked fine. The way I called them was simple and unplanned. I didn't fast, I didn't do any special bathing, or put on special clothes. Those things are nice, especially for an introduction. There are various reasons why those things make it easier for you to experience a spirit. But in this case, I didn't have prior work with Samael and was still able to call on him without a bunch of ritual or special prep. Part of this is that I did not need him to manifest in a way where I could see or hear him, and I did not need to be able to have some visionary experience of him. I just needed his spiritual presence to hear a request and aid with it. So in cases like that you don't need nearly as much to accomplish it. Having worked with spirits in his sphere before, having worked the Abramelin, and having spent a lot of time working with angels in general probably helps. But even if that's not the case for you, angels generally are interested in contact if you're earnestly trying. The prayer was pretty short and wasn't overtly magical. Part of that is influence from the Olympic spirits who all kind of suggest very simple methods of approaching them in my experience, and that of many other magicians I know. But part of it is also drawn from old medieval Catholic ways of working with angels. In Catholic magic a simple prayer to God to send an angel for assistance is normal and doesn't need circles and signs and stuff. In Forbidden Rites it's even noted that sometimes the method of a simple prayer to send an angel was considered acceptable whereas adding in seals and circles would be what crossed the line into “necromancy” and illicit magic. So the simple prayer method is also well attested. In my example you'll note that “Lord of Hosts” or “Adonai Tzvot” is the only “name of God” that I use (unless you count “Holy and Merciful God”). Lord of Hosts is my preferred go-to God Name because, well, it describes God as I understand God, but also it's the most appropriate name from a Merkavah perspective, which definitely influences me. Interestingly enough it's also one of the small handful of names of God which Abraham the Jew says is permitted to use after one received their Holy Guardian Angel and begins to work The Sacred Magic. I asked for something pretty direct, and I said what I would do if I got it. A lot of times when working with a spirit you'll do this in terms of “if you get the girl I like to talk to me, I'll pour rose petals on your seal and then burn them for you as an incense.” You present an if/then in terms of an offering. That can be a good way to go. Sometimes, angels want to see you fixing what's going on with you. They want you to be your best self. So sometimes with an angel your if/then can be “hey, give me the assist to get through this and I'll do my part to make it better.” In addition to that I went online and publicly praised the angel's work. This is something we see in ancient graffiti, people would publicly thank gods and spirits who helped them achieve their desires. Spirits seem to like good publicity. Maybe it means more people will talk to them, maybe it strengthens their anchor in the world. I don't know. But lots of magicians find it's part of what their spirits want, the ancients understood it's what spirits want, and in my experience it goes over well with them. The next day was Sunday. I was supposed to take the car to the shop, since Saturday, everything ran smoothly. Instead, I slept til like 4pm. Now in my defense, normally I sleep like 3 to 5 hours a night, and usually once a week, maybe once every other week, I get a night where I can actually sleep. This had been my first opportunity at any extended amount of sleep for some time. And maybe I got overzealous about sleeping. In any case, I did not fulfill my end of the bargain. When I woke up I tried to. I drove around to a bunch of mechanics shops but they were all closed. Apparently most of them had no Sunday hours, so doing my part would have been tough even if I'd woken up, I did eventually find one that was open though, but they weren't taking anymore work for the day, so ultimately I still missed the mark. The next morning I got up, got ready for work, hopped in my car, got on the belt way...and found that I couldn't accelerate above about 20 miles per hour. My car was shooting huge amounts of smoke out the back, and it felt like it was going to fall apart when I tried to accelerate. I saw cars driving up behind me and thought “oh crap, I'm going to die if I don't get off the beltway” so I quickly exited, called my boss, and told her I wouldn't be in, and headed for the nearest mechanic. I pulled into a repair shop up the street from my house, I asked the guy for an oil change and a tune up. He said it didn't make sense that I'd need a tune up. I explained my problem, and admitted I'd missed an oil change, and he said I should take it to the dealer, because if there's a problem, and he touches it the warranty will be voided. I was like “No, I can't make it to the dealer, I have to bring it to you, I understand I'll have to pay.” So he said he'd do the oil change, and he'd fix a light I'd had out for awhile, and he'd see if that took care of it. He also explained that I was wrong about how frequently I needed oil changes, and that the frequency was twice as often as I'd thought, so I was more negligent than I'd thought. He seemed like a good guy though, I felt like I was in good hands. So I walked home and left him to it. I came back later, and he was done. He told me how hard changing the light was and showed me cell phone pictures. He was cordial and it seemed like everything was going to be ok. Then he was like “So, you'd f-ed.” He walked me over to my car and explained that I'd burned out the turbo charger because I hadn't taken care of the oil. But...he explained it in vivid detail, with lots of curse words. He explained repeatedly how it was entirely my fault, and no one could help me, and that I'd destroyed my car, and at a minimum it would cost me $8K to fix it, each line pretty much included a refrain of how it was all my fault because I'd “f'ed up”. It was the most surreal customer service experience ever. And that was when I realized I was standing in front of a very real manifestation of the accuser. He suggested I try the dealership. I drove to the next town, went to where I'd bought the car, the trip was terrifying. It drove better than it did before the oil change, I could force it to about 40mph now, but each acceleration gave a puff of black smoke, and if I pushed passed forty is was constant smoke and rattling. The dealership told me they couldn't see me for two weeks, but maybe another dealership that took their extended warranty could see me sooner. I drove home, the car riding horribly. I went up to my room, and laid down for an hour trying to relax to get rid of some of the stress, but the mechanic's explanation of my fault and the problems it would cause me just kept vividly replaying in my head so I couldn't sleep, and I could feel my heart racing as I edged just outside of panic. I went back downstairs, and I went to my ancestor altar and made offerings and prayed for help. Then I made essentially the same prayer as before, but this time called on Raphael and Tzadkiel. Making offerings to my ancestors tends to center me, calm me down, and give me strength. When things are bothering me, and I can smell the incense from their altar I start to calm down. Generally knowing they are there looking out for me and helping me is something that helps make me feel good and feel like I'll get through stuff. This is one of the reasons I heavily advocate that people establish an ancestor relationship. Your ancestors can help you with stuff in your life, and they can also help you navigate the spirit world. They can work directly with the spirits you're calling on and make sure they way they are manifesting things is a way which will help you, and having been human, they'll understand in ways other spirits might not. So they can add strength to what you're doing and also clarity to the work that spirits are doing on your behalf. A lot of the time it will make sense to do spirit work at your ancestor altar, having already made offerings to your ancestors and having invited their presence. But you can also do ritual with your ancestors and then go to your altar where you do magic or conjurations and work their having asked already for their aid, maybe taking some token with you, or you can do your magic, like I did, and then go to your ancestors afterwards for help, like I did. In my case I just made offerings and then asked for help, but you might also bring some talisman or physical element of the magic you're working and leave it on the altar for them to work on. There are a lot of ways they can be incorporated into your work. We often talk about needing them as spirits involved in our magic, but we rarely talk about how to do that in a practical sense. In my case, these methods I've described are how I actively work with them in working magic. So in addition to my ancestors, I called on Raphael, for the Sun, and Tzadkiel, for Jupiter. Unlike Samael these are spirits with whom I have a long history of work and familiarity. So it's definitely easier to call them with a more present effect using the simple prayer method. In this case I called them at the same time, which I don't usually do, and I didn't use Orphic hymns or seals. Just a prayer to the Lord of Hosts, and this time especially highlighting his Merciful and Loving nature, and also not just asking for good angels...I asked specifically “send your good AND MERCIFUL” angels. Mercy of course being the opposite of the Judgment inherent in Gevurah. So, why the Sun? The Sun has kind of a magical reset button effect in some ways, it sets things to order. The Sun and Solar Spirits have a lot of cool interesting effects of their own, but in conjunction with other planetary forces the Sun has the ability to set and direct their motion. This is why the Sun is a general force of healing, it creates balance and draws the forces of the body or soul which are misaligned back into alignment. An important part of work in magical development involves engaging this solar principle and learning to use it to give order to the planetary forces as they manifest in your life. This element is also reflected in the relationship between the Abramelin working and the spirit magic which follows it. So in this case I called upon Raphael to create order and direction so that the Martial force would manifest primarily around getting my car fixed rather than around punishing or judging me for any misdeed. I conjured Tzadkiel to add to this balancing effect, since Tzadkiel in addition to the various Jupiterian powers and the fatherly providence and the kingly fecundity which he brings, he also brings Mercy and therefore could stay Samael's hand and cool the fires of judgment. Tzadkiel could also cause those looking at my situation to look upon me mercifully and lean more in my favor than against it. So having conjured the spirits I explained what I needed and then continued with the day. I decided I would go get lunch and then make the trip to the other dealership, with the thought that the lunch trip could help me gauge my ability to drive more. When I got back from lunch I got the urge to check the mail. I'd just checked it over the weekend, and usually I don't check it too often unless I'm expecting something because usually it's just junk. But I thought “hey, maybe something in there will help things seem more alright.” So I opened the mail box and the only thing in it was a recall notice for my vehicle. Now it wasn't for the turbo charger, it was for the computer, but the glitch caused the car to be unable to accelerate above certain speeds similar to what mine was doing and it talked about the high level of danger this could potentially cause. I took this as a good sign and brought the recall notice with me. I went to the dealer, explained my problem, and how I'd taken it to get an oil change today, but I'd misunderstood the frequency and I was late on the oil change, enough so that the new oil already looked bad, and that the oil had burned up the turbo charger so it wouldn't accelerate. Then I showed them the recall notice, and said, while it was a different part, it was the same symptom, and I asked if they could be related. The service station clerk said he'd call to see what the warranty could do, and he led me to the waiting room. About forty minutes later he came out with some paperwork and the keys to a loaner car. Three days later, they'd finished taking apart and reassembling my cars front end, and repairing the problems, and I went and picked it up. The invoice pleasantly had zeros on the bottom. There was no cost. The first mechanic had suggested that maybe the extended warranty combined with the warranty would help reduce the cost but he insisted that the dealer would probably make me pay part of it. Again his estimate was $8K or higher for the work, and since they had to take apart everything, and it took days of work, a high cost seems likely. But in the end it didn't cost anything. The car was definitely new enough, and with few enough miles that the warranty should have covered this, but I've seen situations where routine maintenance was done and the owner just couldn't document it and so claims were denied, let alone cases like mine. So I think this is a win for magic. But I think the story is especially helpful because it illustrates how various spirits and magical forces can work together to shape a manifestation. I think it also shows how when we're not careful a manifestation might have parts that we aren't expecting, or might not want to deal with. I've seen people say that people should only conjure Camael because Samael is essentially the devil, he is poison, the Prince of Rome who God cast into fire for his desire to punish God's favored people. I've seen others say Camael is just a corruption of the name Samael and there is only Samael as the angel of Mars. But Camael seems to be a different name with a different meaning, and people seem to conjure Camael and get successful results from a different sort of presence than the one they get when they conjure Samael. If you look at the history of Jewish angel magic a lot of angel names are basically a random word with God tacked onto it. This isn't even a reductionist statement, it was essentially the concept behind the earliest Jewish forms of angel magic. So Camael also being an angel is pretty reasonable. But that doesn't mean we shouldn't still conjure Samael. Sometimes we need that poison. Sometimes we need to have a mirror held up to show us our flaws and break us down, but we need to know how to then put ourselves back together and what forces we need to draw in to move forward from that experience. Samael may be poison, but he's the poison which is an expression of the divine. Don't let Samael accuse you of missing out by not following us on Facebook!